Down the road a number of mile lies a city called Cambridge. It is well known world wide for the Colleges of the University of Cambridge. The most famous is of course Kings’ College with its’ chapel. I have in my collection two original art works which I would like to share with you which show two of Cambridge’s many facets . The first is an oil painting by local artist Don Beards. It is a quaint image and shows the colour and life of the Cambridge Market. Great St. Mary’s stands in the background imposing herself upon the scene. She is the ‘Cambridge University Church’. A focal point for many a year in down town Cambridge. The market place has existed from Saxon times and a daily outdoor market with stalls continues to operate there today. From the market square, one can step quickly onto King’s Parade, Trinity Street, Sydney Street, and St Andrews Street. A central hub from which life flows to and fro. The heart of a great city filled with vibrancy, colour, youth and learning. The next is a pen and ink drawing of ‘The Lodge, Queen’s College’. When I purchased this artwork, I took it for a nice print (since I forgot my jewellers monocle). After getting it home and studying it up close, I found it to be an original pen and ink drawing. 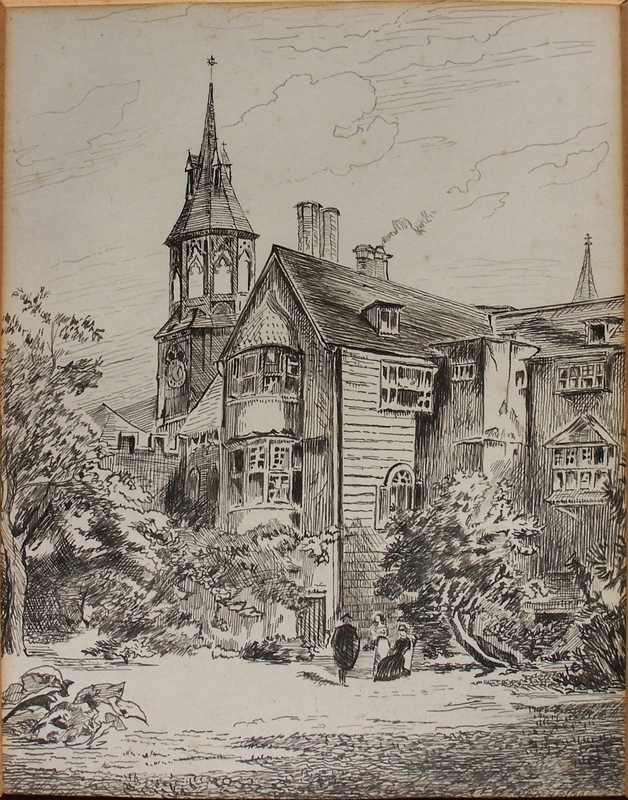 I have seen copies (etchings which are signed C H Toussaint and dated Cambridge 1880) of this artwork on line and I have etchings in my own collection so am quite sure that this is an original drawing. Toussaint lived from1849 to 1911. The signature(bottom left corner) on my drawing is unreadable by me and only reads Cambridge in the bottom right corner. I wonder if this picture is the inspiration for C H Toussaint’s etching or is this just a very, very good hand drawn copy of his etching. I don’t know. I will get my assumptions verified by a pro just to be sure. It, of course, shows ‘The Lodge’ at Queens’ College and behind the lodge stands the Brandon Tower. The tower shown was erected in 1848 and was replaced in 1911. This edition of the tower was considered to be too large and not suited to the height of the rest of the college. To the right of the tower and the focus of the drawing is the ‘Essex Wing’ of the ‘President’s Lodge’. The foreground is, I believe, Walnut Tree Court. A lovely drawing and a wonderful image from the life and history of Cambridge. 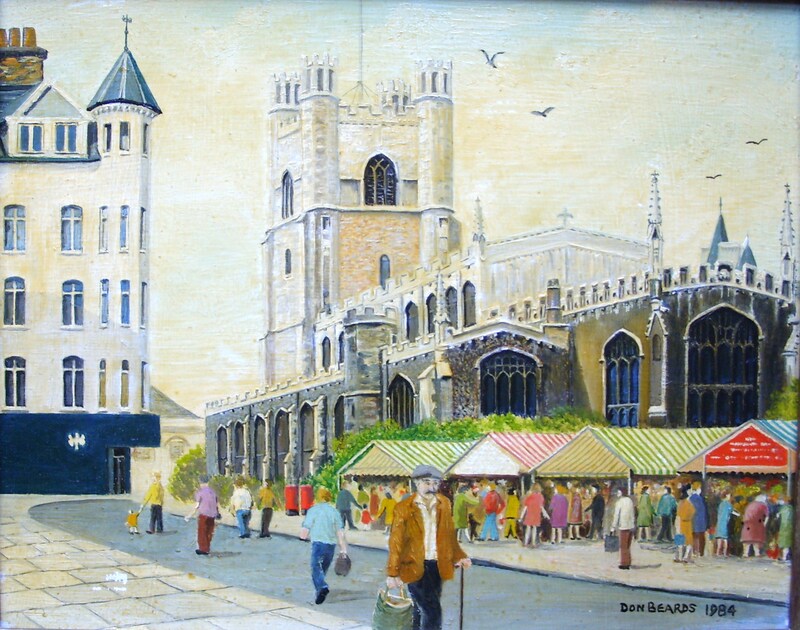 This entry was posted in Drawings and Sketches, Oil Paintings and tagged Brandon Tower, Cambridge, Great St. Mary's, market, Queens' College, scholars, stalls, The Presidents Lodge, Walnut Tree Court. Bookmark the permalink.